“Discernment means seeing truth from a neutral, non-judging and detached perspective. Discernment helps you recognize the true value and potential, intention and capacity in people and situations in your life. It is a way to allow the reality of what is to become clear to you. This is exceptionally helpful. It can minimize the devastation of dashed hopes and the pain of unmet, unrealistic expectations. This can help you conserve and use your precious time and energy in intelligent ways. Your discerning inner eye will help you where there is genuine potential to continue to give or yourself to that, even if others tell you that you are wasting your time and energy when they cannot see as you do. Discernment helps you know what is true for you and what to do (or not do). The power for accurate discernment can be increased in several ways. It takes courage to develop discernment because it is a personal inner knowing. That means, to grow your own discernment, you are going to need to pull back from honouring the opinion of others above your own intuition or instinct. Of course you can ask for the insights of those you trust. This can be very wise. But your discernment will only increase if you then take responsibility for your take on the situation at hand, and ask yourself what you feel, what is true for you, what you sense. You may find that the view of another confirms your own, or that your sense of things is very different, perhaps even it you admire and respect the person whose opinion you sought. You will need to discern for yourself what value you give to the opinion of any other as you take complete responsibility for the choices in your life. This responsibility then gives you absolute freedom to live as you so choose. Sometimes your discernment will need time to cut through misleading appearances and get to the truth; at other times the truth will be very clear to you, perhaps instantly. Your job is to then honour that and respond accordingly with absolute trust. With practice, you will be able to tell when you are discerning and when you are reacting. They will feel very different to you. Discernment is non-judgmental. It sees clearly and without emotion. It is neutral, accurate and compassionate. It does not try to make things other than what they are, nor does it make excuses or condemn anyone or anything. It will however, let you know loud and clear what is right for you and what is not. If you are confused about a matter in your life, uncertain if you are seeing the whole picture or if someone is as they appear to be, you are advised to practice discernment. Complete the following healing process as often as you need until clarity comes. Sometimes the best way to discern a truth is to stop trying to work it out, to step back, ask the Universe to show you what you need to know, and get on with living your life as best you can from a place of loving trust and inner peace. In due course, the truth will be shown – often just at the moment you are really ready to see and know it – and at that time, you will also be ready to act upon what you perceive. There is definitely a theme here to the messages of the first week of this new year: trusting yourself, making your own decisions, using intuition and instinct. And today we tie it all together with taking responsibility for ourselves, our decisions and our lives. If we make our own decisions, we create our world around us very deliberately. If we do it mindfully, we use discernment, then we cannot be victims. Life is not happening “to” us, we are participating fully in it. We are creating, we are manifesting. We are choosing who to invite in, who to give our energy to, who to spend our precious time with. We are taking the reins. If this is a new concept for you, and you are used to others making your decision for you, it may bring up some fear. That is a good thing! Allow yourself to feel uncomfortable if that is what comes up for you, and move forward regardless! That is how you will learn to trust yourself. Watch your physical bodies for signs of which choices make you feel light and joyful, and which feel heavy and challenging. Try to follow your gut instinct without constantly second guessing yourself! It is always good to do your due diligence and make sure that you get all the facts if you are looking at making a life altering choice. If it is a person you are trying to decide on, use your gut, tune into their energy. If something doesn’t feel right, LISTEN!!! If it feels light and right, give it time, let them show you their true self. Trust needs to be earned, not given away too freely. If face value feels a little off, give time and space. Ask for assistance from the Universe and set your intention that clarity come to you. Know that it will. And know that if someone does not fit for you, someone else will! When one door closes, another one opens. 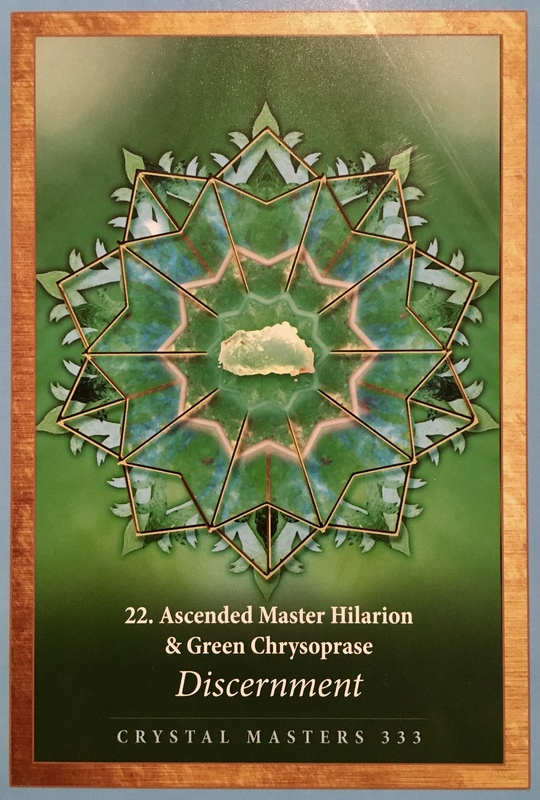 If you have Chrysoprase in your crystal collection, now would be a great time to work with it’s uplifting heart centered energies. It is also a stone of the solar plexus chakra, helping to give us strength an courage to move forward and life the life of our dreams, creating with the energies of truth and love.